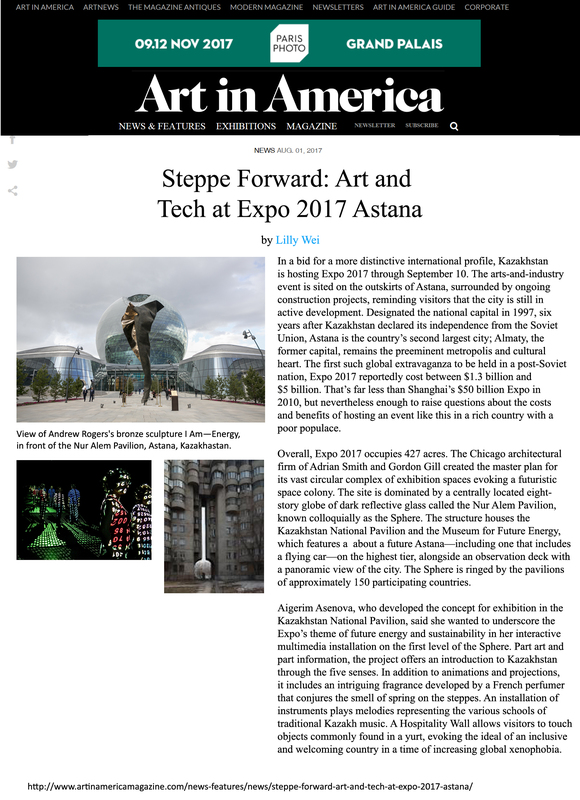 In a bid for a more distinctive international profile, Kazakhstan is hosting Expo 2017 through September 10. The arts-and-industry event is sited on the outskirts of Astana, surrounded by ongoing construction projects, reminding visitors that the city is still in active development. Designated the national capital in 1997, six years after Kazakhstan declared its independence from the Soviet Union, Astana is the country’s second largest city; Almaty, the former capital, remains the preeminent metropolis and cultural heart. The first such global extravaganza to be held in a post-Soviet nation, Expo 2017 reportedly cost between $1.3 billion and $5 billion. That’s far less than Shanghai’s $50 billion Expo in 2010, but nevertheless enough to raise questions about the costs and benefits of hosting an event like this in a rich country with a poor populace. Overall, Expo 2017 occupies 427 acres. The Chicago architectural firm of Adrian Smith and Gordon Gill created the master plan for its vast circular complex of exhibition spaces evoking a futuristic space colony. 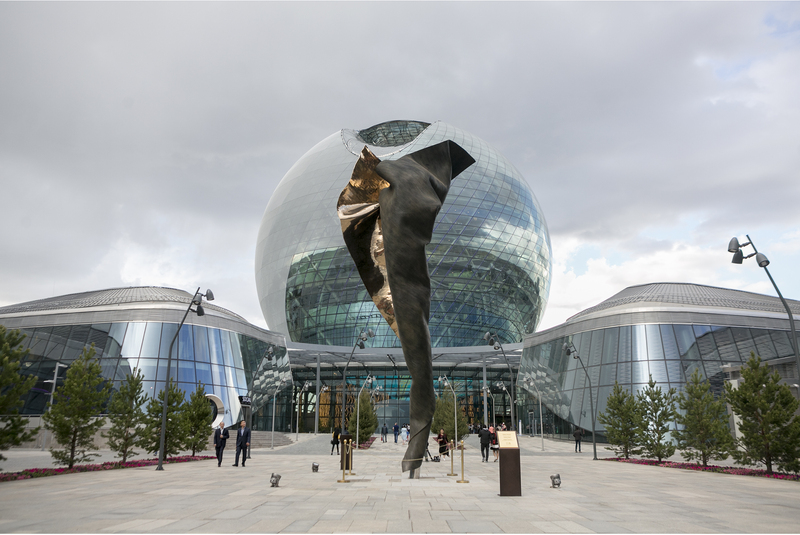 The site is dominated by a centrally located eight-story globe of dark reflective glass called the Nur Alem Pavilion, known colloquially as the Sphere. The structure houses the Kazakhstan National Pavilion and the Museum for Future Energy, which features a about a future Astana—including one that includes a flying car—on the highest tier, alongside an observation deck with a panoramic view of the city. The Sphere is ringed by the pavilions of approximately 150 participating countries. Aigerim Asenova, who developed the concept for exhibition in the Kazakhstan National Pavilion, said she wanted to underscore the Expo’s theme of future energy and sustainability in her interactive multimedia installation on the first level of the Sphere. Part art and part information, the project offers an introduction to Kazakhstan through the five senses. In addition to animations and projections, it includes an intriguing fragrance developed by a French perfumer that conjures the smell of spring on the steppes. An installation of instruments plays melodies representing the various schools of traditional Kazakh music. A Hospitality Wall allows visitors to touch objects commonly found in a yurt, evoking the ideal of an inclusive and welcoming country in a time of increasing global xenophobia. Three contemporary art exhibitions are also on view. 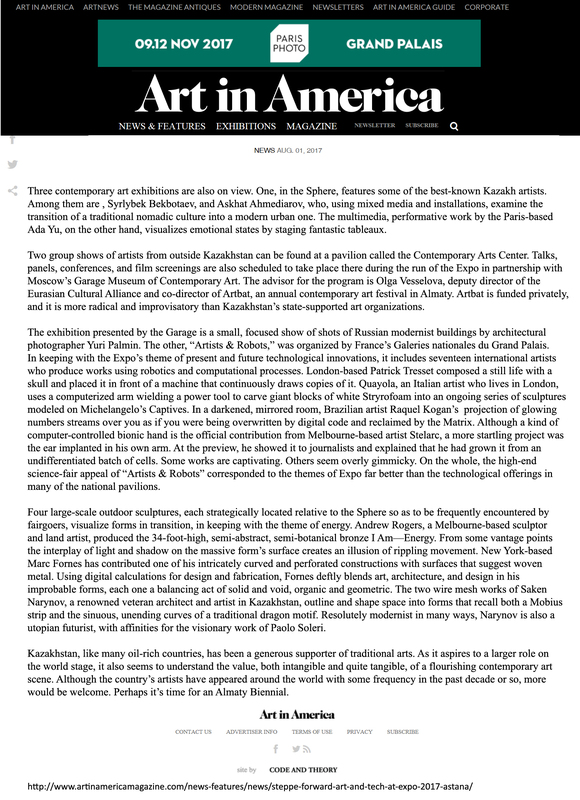 One, in the Sphere, features some of the best-known Kazakh artists. Among them are, Syrlybek Bekbotaev, and Askhat Ahmediarov, who, using mixed media and installations, examine the transition of a traditional nomadic culture into a modern urban one. The multimedia, performative work by the Paris-based Ada Yu, on the other hand, visualizes emotional states by staging fantastic tableaux. Two group shows of artists from outside Kazakhstan can be found at a pavilion called the Contemporary Arts Center. Talks, panels, conferences, and film screenings are also scheduled to take place there during the run of the Expo in partnership with Moscow’s Garage Museum of Contemporary Art. The advisor for the program is Olga Vesselova, deputy director of the Eurasian Cultural Alliance and co-director of Artbat, an annual contemporary art festival in Almaty. Artbat is funded privately, and it is more radical and improvisatory than Kazakhstan’s state-supported art organizations. The exhibition presented by the Garage is a small, focused show of shots of Russian modernist buildings by architectural photographer Yuri Palmin. The other, “Artists & Robots,” was organized by France’s Galeries nationales du Grand Palais. Palais. In keeping with the Expo’s theme of present and future technological innovations, it includes seventeen international artists who produce works using robotics and computational processes. London-based Patrick Tresset composed a still life with a skull and placed it in front of a machine that continuously draws copies of it. Quayola, an Italian artist who lives in London, uses a computerized arm wielding a power tool to carve giant blocks of white Stryrofoam into an ongoing series of sculptures modeled on Michelangelo’s Captives. In a darkened, mirrored room, Brazilian artist Raquel Kogan’s projection of glowing numbers streams over you as if you were being overwritten by digital code and reclaimed by the Matrix. Although a kind of computer-controlled bionic hand is the official contribution from Melbourne-based artist Stelarc, a more startling project was the ear implanted in his own arm. At the preview, he showed it to journalists and explained that he had grown it from an undifferentiated batch of cells. Some works are captivating. Others seem overly gimmicky. On the whole, the high-end science-fair appeal of “Artists & Robots” corresponded to the themes of Expo far better than the technological offerings in many of the national pavilions. Four large-scale outdoor sculptures, each strategically located relative to the Sphere so as to be frequently encountered by Four large-scale outdoor sculptures, each strategically located relative to the Sphere so as to be frequently encountered by fairgoers, visualize forms in transition, in keeping with the theme of energy. Andrew Rogers, a Melbourne-based sculptor and land artist, produced the 34-foot-high, semi-abstract, semi-botanical bronze I Am—Energy. From some vantage points the interplay of light and shadow on the massive form’s surface creates an illusion of rippling movement. New York-based Marc Fornes has contributed one of his intricately curved and perforated constructions with surfaces that suggest woven metal. Using digital calculations for design and fabrication, Fornes deftly blends art, architecture, and design in his improbable forms, each one a balancing act of solid and void, organic and geometric. The two wire mesh works of Saken Narynov, a renowned veteran architect and artist in Kazakhstan, outline and shape space into forms that recall both a Mobius strip and the sinuous, unending curves of a traditional dragon motif. Resolutely modernist in many ways, Narynov is also a utopian futurist, with affinities for the visionary work of Paolo Soleri. Kazakhstan, like many oil-rich countries, has been a generous supporter of traditional arts. As it aspires to a larger role on the world stage, it also seems to understand the value, both intangible and quite tangible, of a flourishing contemporary art scene. Although the country’s artists have appeared around the world with some frequency in the past decade or so, more would be welcome. Perhaps it’s time for an Almaty Biennial.